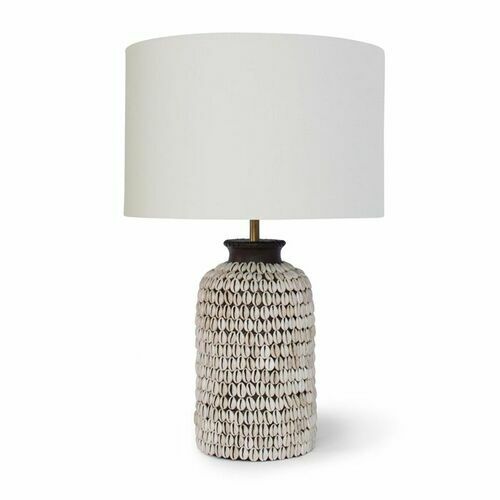 Costa Table Lamp with Natural Linen Shade features an intricate design of little white shells arranged in a repetitive pattern all around the column of the Coasta Lamp. Its artistry brings a touch of the ocean to your elegant coastal living room or bedroom. Topped with a Natural Linen Shade. Takes one 3-way 150 watt max bulb (not included) and 8' cord. Note: Natural and semi-precious materials are products of the nature. Any variations in color, pattern, texture, size and veining should not be considered as a defect.